​Available at MSR, Amazon, iTunes, and other online outlets. 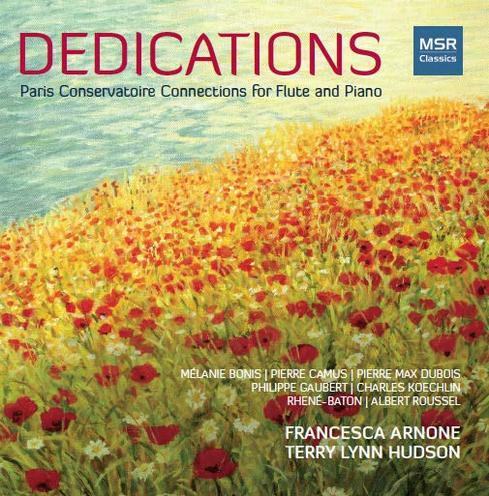 French connections abound on this recording of flute and piano compositions written between 1913 and 1959. This period of less than fifty years illuminates the inspired collaborations of many of the flute world’s most prestigious teachers, performers and composers of the Paris Conservatoire, illustrating a mutually rich symbiosis of French artists. Like most heritages, it may be difficult to see where one influence ends and the next begins, yet the flute remains the happy recipient of a rich and satisfying repertoire resulting from this complicated family tree of composers and artist-teachers. Featuring works for flute and piano by Bonis, Camus, Dubois, Gaubert, Koechlin, Rhene-Baton, and Roussel.